Welcome to Starboard Yachts, Inc.
"Remember the basics still apply........"
2015 What's happening in the pleasure boating business? "Exceptional freshwater boats - power, sailboats, & trawlers"
You, our customer, comes first... without you we don't exist. We will be honest with you. We will go the extra mile for you. When right, we will accept it; when wrong, we will admit it. You should enjoy having us work for you, because you have a choice. We will get positive results for you. We will thank you for being our customer. 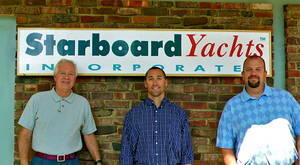 Starboard Yachts, Incorporated, a full service yacht brokerage located in the port town of Holland, Michigan, is licensed and bonded to act as boat broker for buyer and seller. We will manage the listing and sale of your boat, your search for a vessel, custom boat construction, yacht financing, yacht insurance and worldwide yacht deliveries. Call about any of our used boat listings or with any boating questions. If we can help we will, if we cannot we will tell you. Known for building superior quality mid-sized luxury yachts, this highly customized Tiara 4700 Sovran has been pampered since new. Classic design with flag blue hull, teak finishes and custom Tortola stripe upholstery puts ENCORE in a class by itself. You won’t tire of hearing “what a beautiful boat” from fellow boaters and admirers. 100% fresh water, only used on the Great Lakes four months a year, then stored in heated storage. This gives ENCORE a significant advantage over salt water or southern based boats that are susceptible to intense sun damage and used year-round. Immaculate condition with fastidious owners that take pride in maintaining ENCORE to pristine condition.